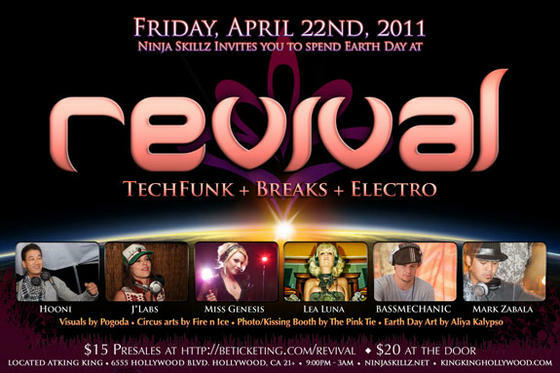 Live Art: 4/22 Ninja Skillz Revival!!!!! This month, we are highlighting bass-driven cross-genre DJs, from san diego to los angeles, that all excel at blending together funky breakbeats and straight beats, dirty electro and wobble basslines, and elements of tech, house and progressive to create a unique, high-energy dancefloor journey across multiple electronic music styles. Don’t know what that means? Click on the DJ links below to listen! Join us at our Grand Opening as we support dance music, underground culture, and inject new life into the club scene. Earth Day Carpooling HIGHLY Suggested. Parking at Hollywood and Highland with a ticket validation at one of the local shops also suggested. We want to bring you the energy and freedom of New Year’s night every month! Featuring Earth-friendly, low-power, LED lighting. One of the few female VJs in the industry, Pogoda brings a unique creativity to the table when it comes to live performance. Refusing to hide behind the scenes, she hopes to bring live video mixing into the light, and to show audiences that this is an art that is interesting to watch, and something that can be interactive. Each performance is unique and tailored to the event and venue, and incorporates software-supported mixing of videoloops that range from geometric patterns, video clips, and live feeds. Using various midi controllers, from Dance pads, to an APC, to video game controllers, and often in costume, she commands attention. In addition to mixing video, Pogoda will often surprise audiences with an arsenal of bubble weapons, marshmallow bows, and any other toys that bring joy, reminding us that we are never too old to play. — and a few surprises! Ninja Skillz has risen to the forefront of the Underground Community with successful appearances at major LA nightclubs such as Spundae, Avalon, Vanguard, The Hollywood Palladium, multiple sold out festivals in Mexico, Yacht parties, Catalina Island, and several outdoor events all over the West Coast. It is the firm commitment of Ninja Skillz Music to bring together all manner of art, media, and culture to create multi-sensory, transcendent experiences. By combining diverse dancers, visual artists, circus performers, fire dancers, gods, goddesses, muses, and madmen, Ninja Skillz will continue to be a weapon against the mundane.